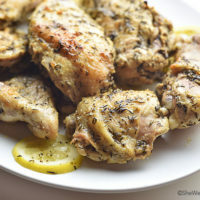 Here’s another simple chicken dish, seasoned with fresh lemon juice, garlic, and thyme. Once the super simple marinade is combined, a little bit of time for marinating is needed. 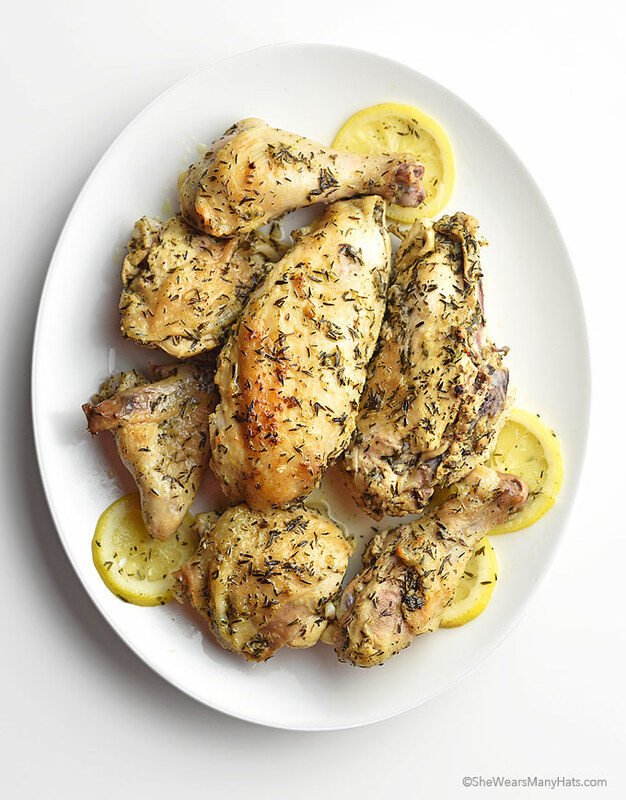 After marinating, this Easy Garlic Lemon Thyme Chicken only takes about 30 minutes to cook, which makes it perfect for any night of the week. For easy prep ahead of time, combine the marinade then cover and refrigerate until ready to marinate the chicken. I recommend only marinating the chicken for a maximum of 2 hours. Citrus can give chicken a weird texture when marinated for too long. For best results, stick to a minimum of 30 minutes up to a maximum of 2 hours for the marinade time for this recipe. 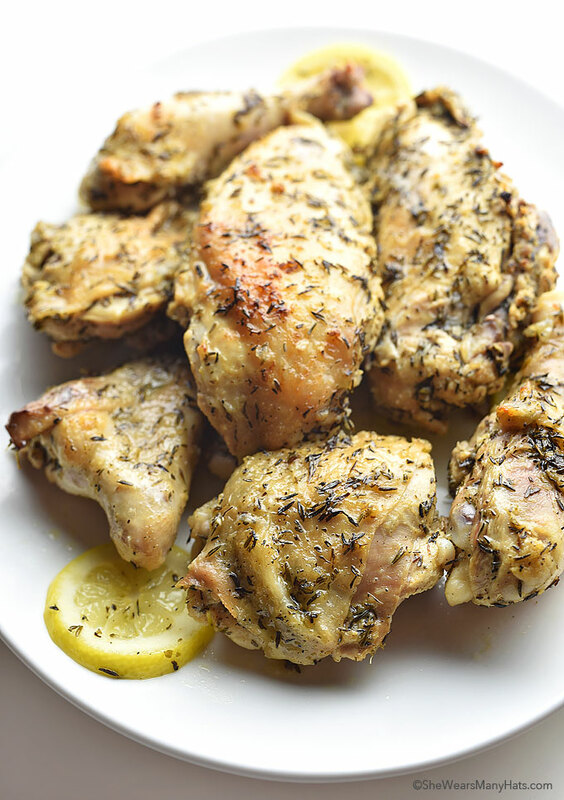 The marinade ingredients for this recipe are basic: olive oil, fresh lemon juice, grated garlic, dried thyme, salt and pepper. It is such a lovely flavor combination! Plus, all of the ingredients are easy to keep stocked and ready to go. We make this simple chicken dish often just because we usually have all of the ingredients on hand. If needed, substitutions can be easily be made. The fresh lemon juice can be replaced with any fresh citrus, like lime or orange. Dried oregano, basil, rosemary or an Italian seasoning mixture could be easily substituted for the dried thyme. Although thyme is always such a lovely compliment to citrus, especially lemon. Easy Garlic Lemon Thyme Chicken is a nice served with scalloped potatoes, sautéed garlic lemon green beans, and a fresh salad. 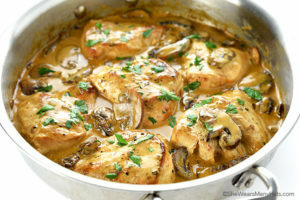 While this chicken recipe is easy enough for any night of the week. It is certainly delicious enough for serving at a special occasion or dinner party. Enjoy! Combine olive oil, lemon juice, garlic, thyme, salt and pepper in a large zip-top plastic bag. * Add chicken pieces; seal bag and turn to coat. Place in refrigerator and marinate for at least 30 minutes up to 2 hours. 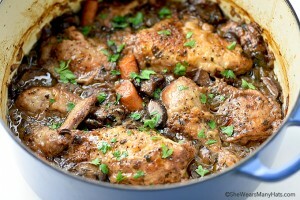 Arrange chicken, skin side down, in a single layer in an oven-proof skillet, baking dish or pan. Pour marinade over chicken. Bake uncovered for 15 minutes, turn chicken to skin side up and continue baking for another 15 minutes or until chicken is done. Marinade can be made a day ahead, but I do not recommend marinating chicken for more than 2 hours. *Or use a glass bowl or dish. 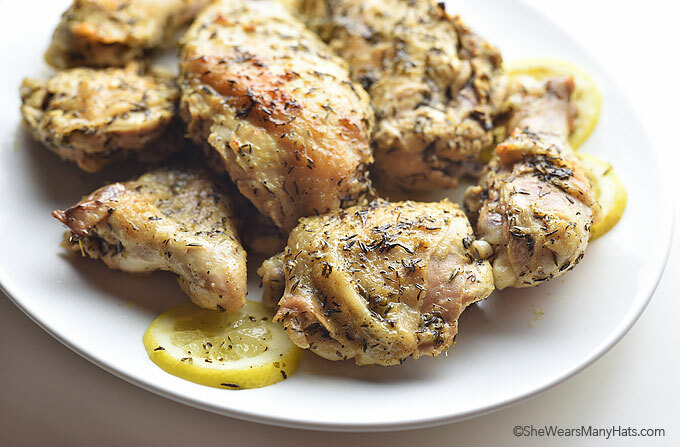 Has anyone made this with boneless, skinless chicken–breast and thighs? I’m planning to make these this week with boneless breasts. The lemon juice should help keep them moist. I made this recipe w/boneless/skinless chicken thighs. Decreased baking time. Great!